ΑΛΛΗΛΟΒΟΗΘΗΤΙΚΗ ΕΝΩΣΙΣ ΚΑΡΔΑΜΥΛΙΩΝ ΧΙΟΥ "Η ΠΡΟΟΔΟΣ"
On December 12, 1935, a small number of Κardamylians met at 318 Atlantic Ave., in Brooklyn, NY and decided to form an organization to promote support among themselves and promote moral and material support of their place of origin. 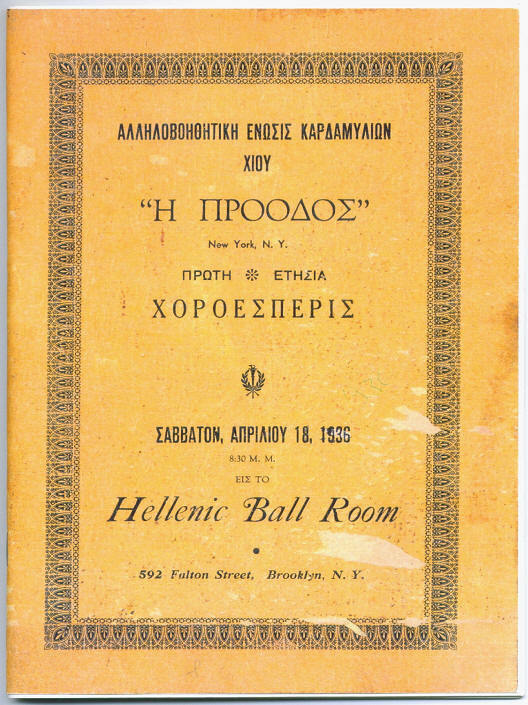 Even though the following year the organization was officially chartered with the New York State under the new name KARDAMYLIAN LEAGUE, INC., for the first 20 years at least, it continued to be called by its membership and use with its correspondence, meetings and events the name "ADELFOTIS KARDAMYLION" or "ENOSIS KARDAMYLION". In conjunction with its 1st Annual Dinner Dance that was held on Saturday, April 18, 1936, the organization published its 1st Commemorative Journal. In it the purpose and the interests of the Founders are described first hand. The copy of the 1st Commemorative Journal that follows is courtesy of Mrs. Calliope Vafias.